Wait, let’s back up a minute. It’s early December and Sonya’s parents are visiting from the US and we all are in Zurich when Sonya’s mother says she thinks Sonya is putting on a few pounds (yikes!) and asks if she might be pregnant. After Sonya calms down a bit, I ever so carefully mention that she has gotten a bit more round, but that it happens to be all in one place. Beer belly? Back in Basel, Sonya breaks from the office and gets a pregnancy test, takes it at work and viola, it is positive! Step 2 – she goes to the clinic near her office for a second opinion and bam, confirmed! Step 3 – we schedule an appointment with the doc that delivered Drake for the first ultrasound. This is great. We planned to start trying for a 2nd early this year so all is well. Fast forward to the appointment just before Christmas, and to the ultrasound. 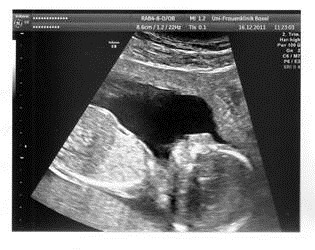 We expected to see a nice small clump of cells and maybe a heartbeat but were floored when we saw… A FULLY FORMED BABY! She was already 15 weeks along! We got pregnant in September and didn’t know about it. Why didn’t we know? Ask Sonya, it involves breast feeding and other girl stuff. · #2 is on the way – Year of the dragon! Hope all is well with all of you and happy 2012! ← A big project finished. Whew! So happy for you guys!!!! Best wishes for the sequel!! !